Established in the 1800’s in the center of the famed Indian River, Cocoa Beach, accessible from Port Canaveral, offers a sight into old Florida. The beach is beautiful although the day we were there the weather was not good. Fun and easy day at the beach. Fun and easy day at the beach. They take you to a store where you can rent chairs/umbrellas/surfboards etc. Two block walk to the beach. It was okay. Not much to see here and I rented a chair for $9. It was fun. Not enough time allotted to go to Disney for the cost of entry. Cocoa beach was fine. We have been to Florida beaches many times so we just wanted to walk to the ocean for a bit and check out some shops. We only stayed a couple of hours. Transportation was easy and staff were informative. water was beautiful, sand was not. water was beautiful, sand was not. transportation was easy. Shuttle ran every 30 minutes. all we did was take a bus to the beach -people waiting on the beach with chairs, umbrellas, etc (extra of course, but not a lot) there were a few shops and a few restaurants - it was a beautiful day. Easily got off of the ship, jumped in mini van waiting outside and was taken the ten minute dive to the beach. Area is very nice. RonJon is right there as well as restaurants and even a convenient store. I booked a Fly, Snooze, and Cruise package with Go Port Canaveral. I booked a Fly, Snooze, and Cruise package with Go Port Canaveral. It took all the worry and stress of getting from the airport to the hotel, hotel to port, and port back to airport. Their drivers were very friendly and prompt. It was an expensive option to just go five minutes away from the ship to shop for the same old stuff. It was too cold to enjoy the beach. Went to the beach and walked around and shipped a little. Went to the beach and walked around and shipped a little. Exactly what we expected from the description of the excursion. The tour is just a bus ride to and from the Cocoa Beach Surf Shop. The tour is just a bus ride to and from the Cocoa Beach Surf Shop. We shopped here and across the street at Ron Jon Surf shop. We also went to the beach which is close by. Cocoa Beach is defiantly not a nice beach. They overbooked the shuttle and we had a long line of people that thad to wait for buses. They overbooked the shuttle and we had a long line of people that thad to wait for buses. We were told that people who booked later times took our slots on the buses. Poorly managed. Cocoa Village was boring in my opinion. Cocoa Beach was extremely crowded, and the public restrooms were unkept. 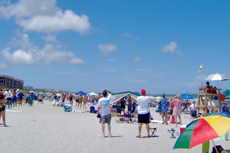 Cocoa Beach was extremely crowded, and the public restrooms were unkept. I would not go back again. I did the Cocoa Beach/Cocoa Village tour. Cocoa Beach is amazing if you like waves and do not mind crowds. Cocoa Beach is amazing if you like waves and do not mind crowds. Some people were learning to surf and that looked fun. But, my graddaughter got stung by a Man O&apos;War jelly fish. Out visit was cut short. We purchased chair and umbrella and they brought it to us because I am handicapped and could not walk to their location. Was very nice. A bit pricey for a shuttle, but convenient.